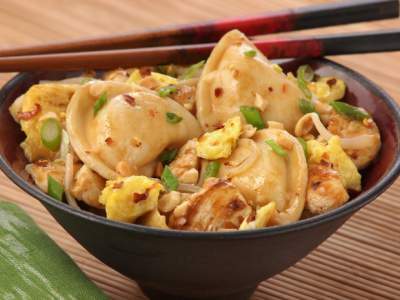 Ready-made potato-cheddar pierogies add a new dimension to the traditional Pad Thai. Boil pierogies as package directs. Drain. Meanwhile, melt butter in 12-inch skillet over medium-high heat; cook eggs until just scrambled, stirring constantly. Remove to bowl. In same skillet, heat peanut oil; over medium heat, cook garlic until lightly browned. With slotted spoon, remove garlic to bowl with eggs. In drippings remaining in skillet over medium-high heat, cook chicken until well browned and cooked through, stirring constantly. Add salt and crushed red pepper. Stir in egg mixture, peanut sauce, bean sprouts and cooked pierogies. Toss to mix well. Garnish with chopped peanuts and scallions.